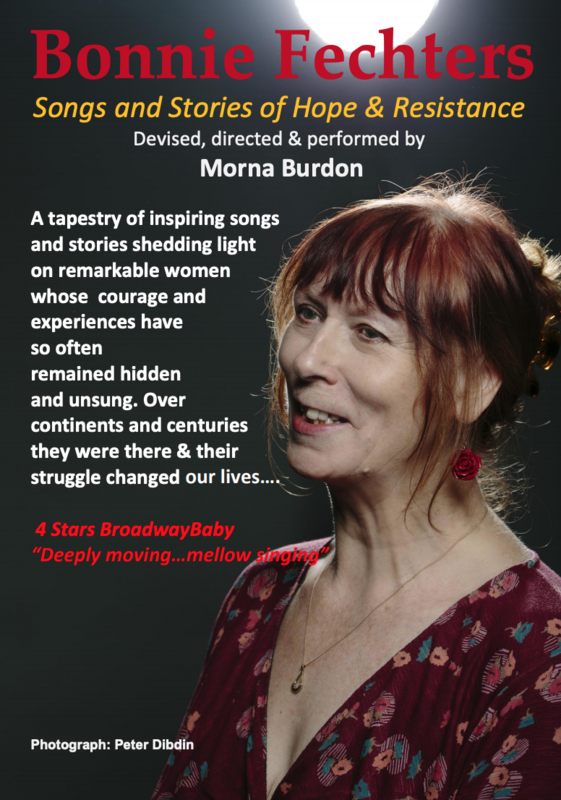 A Bonnie Fechter is someone who stands up for themselves or for what they believe in, and in her show of that name Morna weaves an inspiring tapestry of songs and stories shedding light on remarkable women whose courage, love, inventiveness and human spirit changed all our lives forever. In 50 minutes, the audience discover the names of Scottish women targeted as witches, hear tales of the girls who survived the Magdalene institution for ‘fallen women’; explore the 1976 ‘Strikers in Saris’ protest and many more as the show journeys from Scotland to Vietnam to the Czech Republic ; from U.S.A. civil rights and labour activists to late 19th century Syrian refugees; from the 9 year old girl who played the pipes outside prison gates to support the Suffragettes, to the modern photographer who rode horseback in Mongolia with her 6-year-old daughter to record the lives of women there. Following some performances, in agreement with the venue, there is an invitation for audience members to stay behind to share stories of women they know of who have also been bonnie fechters. Suitable Audiences: Aimed at adults but suitable for 12 upwards. "Inspiring, humbling, entertaining" Andy Cannon, Co- founder, Wee Stories Theatre Co.